This was based on a recipe i found on line that caught my attention and I thought lets give it a go. On the inhale you get a sweet vanilla soft cookie that transitions to a nutty, caramel popcorn, graham cracker finish. it is good at 3 days but the popcorn builds over time and comes out at 7 days . best at around 60 - 65 watts . Feel free to add additional sweetner if you want that commercial feel - as this is a in your face commercial style mix and not meant to have alot of subtly - but the cake batter dip provides alot of sweetness that comes out over 3 - 5 days. caramel popcorn, AP and kettle Corn create the popcorn base. it tends to grow a bit. 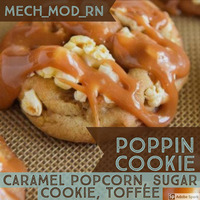 The Caramel popcorn and peanut is very light on the popcorn but has a really nice peanut finish . Kettle corn has a nice buttery sweet note that I am using here along with AP to provide more of a popcorn note. "NOTE AP is not necessary but does support the popcorn and cookie in this mix. Graham cracker and Sugar cookie creates a really nicely balanced cookie with a soft center and slightly darker baked crisp notes from the Graham cracker.